With adults up to 2 in. long, mole crickets are the largest insect pests in turf and, by virtue of their size, can be the most destructive as well. 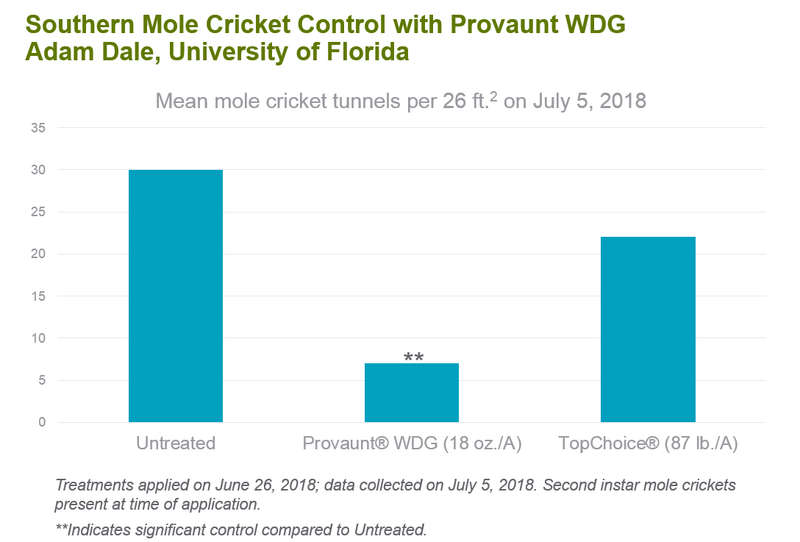 When mole cricket populations are high, their tunneling and feeding activity can decimate large areas of turf in no time. ​​​​​​​Left: adult mole cricket. 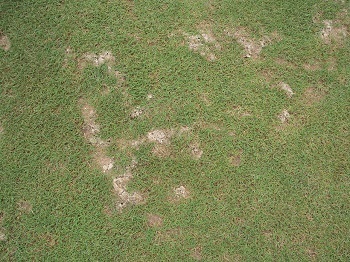 Right: mole cricket damage. Source: Lane Tredway, Syngenta, 2010. As with most pests, mole crickets are easier to combat early in the season when they are small. 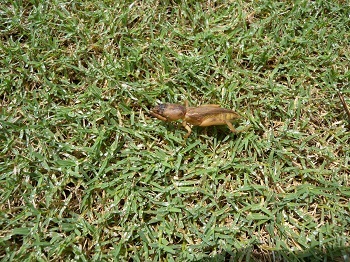 Mole crickets are best controlled just after egg hatch, when the small nymphs are most sensitive to insecticides. When the hatch occurs, however, can vary widely from year to year based on soil temperature, moisture and other environmental factors. Local scouting is essential to determine the best timing for mole cricket applications. Scouting for mole crickets is easy with a simple soap water flush (1 oz. of lemon-scented dish soap per gallon of water), which will quickly bring mole cricket nymphs and adults to the turf surface. Mole crickets have a tendency to invade the same spots year after year, so monitor previously infested areas to increase your chances of finding a population. For more details and a demonstration of a soap water flush, watch the video below. Source: Adam Dale, University of Florida, 2018. Performance evaluations are based solely upon interpretation of public information and field observations. Trials reflect treatment rates commonly recommended in the marketplace. For more information about mole cricket control, contact your local Syngenta territory manager. *Please see the Provaunt Insecticide Mole Cricket Assurance Program sheet for terms and conditions. ©2019 Syngenta. Important: Always read and follow label instructions. Some products may not be registered for sale or use in all states or counties and/or may have state-specific use requirements. Please check with your local extension service to ensure registration and proper use. Provaunt® and the Syngenta logo are trademarks of a Syngenta Group Company. All other trademarks are the property of their respective owners.